I think this is becoming an habit of mine... two posts in a day? I hope you don't mind! I'd like to announce that this is my 60th post on my blog and I'm so grateful and excited! I also now have 70 followers! I thank you all so very very very much. I'm glad to be able to share my love for nail polishes and all things beauty/bargain/sales with you all. 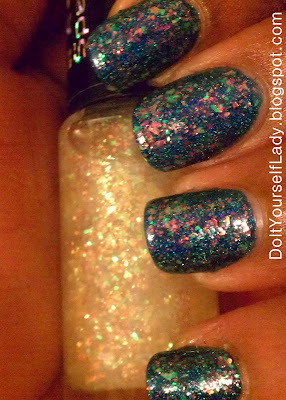 Early today, I posted my swatch and review of HITS Apolo. Apolo is now one of my favorite polishes! After staring at my beautiful nails for a while, I kept telling myself nothing could make Apolo more beautiful than it already is... but then, I looked in my stash, and saw Lambada. Lambada was also purchased from Llarowe, and since I hadn't used her, and she's a layering polish, I decided to layer her over Apolo. It's like flakie heaven! My camera wasn't working well with the finished result, and it was late at night, so no way to get some sun to show y'all the beauty. And then I thought of something! If I can't get a good picture, I should be able to get the awesomeness on video, under some light in my room! Now I present to you, a video of this layering goodness! What do y'all think ladies? It's like a blue "Unicorn puke" right? I Love it, love it! Thanks for viewing ladies, Till later, God bless! Thanks ladies. I love accidental/unplanned awesomeness like this! I just thought to try it out, and it blew me away! A huge congratulations on your 60th post!! :D You are a really kind and sweet person who has a wonderful blog, and I am very privileged to be able to read it! :D I wish you great success!! Oh my god are you serious? I did that too.. I had to try and take pictures with my iphone.. and they were more accurate and actually focused, but not great quality..
And thanks! (lashes) you think so? 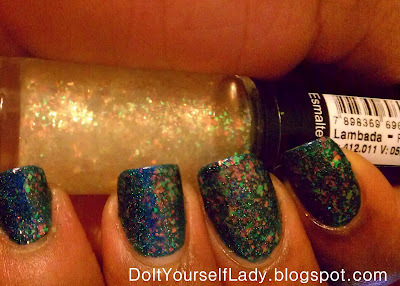 Where do you get these varnishes from?! I live in the UK and cannot find them anywhere! That's where I get these specific polishes from. Customer service is great and the shipping is worldwide and affordable. Have You Joined The Cult?